We’ve been speaking to skincare guru Antonia Burrell on her new range, her top tips and her thoughts on double cleansing. Having studied, and then lectured in, the chemistry of aromatherapy, Antonia is a trusted skin expert and has two decades of experience in the beauty industry. Providing facials and counsel to high profile celebrity clients, she has built a reputation as one of the industry’s leading skincare experts. Antonia is known for her use of holistic and natural plant remedies to effectively repair the skin, and to reveal a flawless and radiant complexion, which has resulted in the recent development of her own holistic skincare collection (which you can see here). You’re extremely well-known as one of the UK’s top skincare experts, what first inspired your passion for skincare? When I was 19 and studying beauty therapy at The London College of Fashion, I knew I always wanted to create a skin care collection. There are so many chemicals and stresses (direct or indirect), in our daily life so creating a time for calm with gorgeous natural aromas and beautiful textures helps to release some stress, improve the skin and provide natural, clinically proven, powerful solutions. Tell us a little bit about your career, and how you got to where you are? I was Head of Retail at Sanctuary, Regional Business Development Manager at Aveda, and taught the chemistry of aromatherapy at London College of Fashion. Eventually I launched my own beauty clinic and in three years I had three clinics. I then decided to start my own skincare line using 100% natural plant formations. Meeting and doing a facial on Princess Tatiana of Greece and all of the celebrity skins I look after. When I see them on TV or in magazines I’m like…”that’s my skin”. Your Natural Face Lift Facial is extremely popular, can you tell us a little about it and how you developed it? My Pure Face Lift Facial was designed to improve health and well-being and is based on balancing, deeply relaxing, yet energising advanced massage techniques. It took me over 4 years of research and development to perfect these techniques, and the treatment is so advanced that it has been formally accredited by one if the industry’s top awarding bodies. This sumptuous, lush, stress melting, all encompassing treatment irons away wrinkles, lifts facial muscles and releases deep-seated tension to unlock a new you…it’s one of my favourites! You’ve got your own line of wonderful products, how and why did you decide to take this step? The creation of my holistic skincare collection started in my kitchen and was inspired by my clients who in their mid to late 30’s started to develop skin problems – as well as being concerned with the issue of ageing skin. They wanted to use natural products that worked. There seemed to be a real generic frustration that natural products didn’t work very well. There was one client in particular who was recommended to come and see me. She had a very high profile front facing job, and career, and didn’t look in the mirror or even style her hair as she felt ugly. She was distraught, and she said had tried ‘everything’. It’s really because of her and the accumulation of lots of my other clients’ demands that the green light went on for me. I felt like I must try and help. So I decided to take on this challenge; to help my clients and try to meet their needs. My chemistry knowledge needed to be put into practice! Woah…what had I agreed to? I owned three beauty clinics at the time and would often take concoctions into clients for them to try and they reported back with delight! They liked what I had given them and asked for more… It reminded me of the Oliver script … ‘Can I have some more?’ My whole apartment became a lab and smelt fabulous…the aromas were coming out of the bricks outside. Launching to market had its challenges, but I began to attract some very special people, who were and still are, respected specialists in their areas who saw the vision, helped me to develop the collection, gave me fabulous advice and supported me. My favourite beauty ritual is to soak in a long, hot bath with some magnesium flakes, and mix myself up a salt scrub using sea or Himalayan pink salt, coconut oil, lavender and rosemary essential oils. I then massage this over my body focusing on the feet, elbows and knees to reveal silky soft skin. What’s the best small change we can make for better skin? Or your top tip? My go-to tip is to ‘double cleanse’. The first cleanse is primarily for ‘taking off the day’; removing makeup, SPF, pollution and dust that sits on our skin and clogs our pores. It is essential during this stage to ensure all makeup around the eye area is removed thoroughly, as any left over product will dry the skin. A thorough cleanse in areas such as the side of the nose and just above the chin is also important as these tend to produce more sweat and oil throughout the day – and gather more dead skin cells which will in turn block these pores and results in bumps under the skin or blackheads. The second cleanse penetrates the skin, meaning your product can really get to work and you can reap the benefits. My top tip is to massage your product into the skin in upwards motions to give the complexion a natural lift and then remove with a hot cloth for a gentle exfoliation. What’s your skin profile? Do you have any concerns and how to you address them? Having darker skin means it tends to get a little more oily than most. To combat this I double cleanse with my Natural Glow Cleansing Oil twice a day. I also exfoliate with my Luminous Light Polishing Powder every other day to remove dead cell build up, and promote new cell regeneration. Although on the oily side, my skin can also be dehydrated and sometimes I find dry patches developing during the day. To help keep my skin soft and supple, I use my Cream Supreme Facial Moisturiser twice a day. I also use a sweep of my Forest Dew Skin Conditioner that contains a French plant extract that hydrates the epidermis for 8 times longer and deeper than hyaluronic acid. I’ve just launched my brand new Mask Supreme 7-in-1 and I love it! It delivers 7 amazing skin benefits in just 10 minutes that every single skin type and condition can benefit from. It’s just like having an expert facialist in your bathroom to deliver professional results…I call it my personal facialist in a jar! 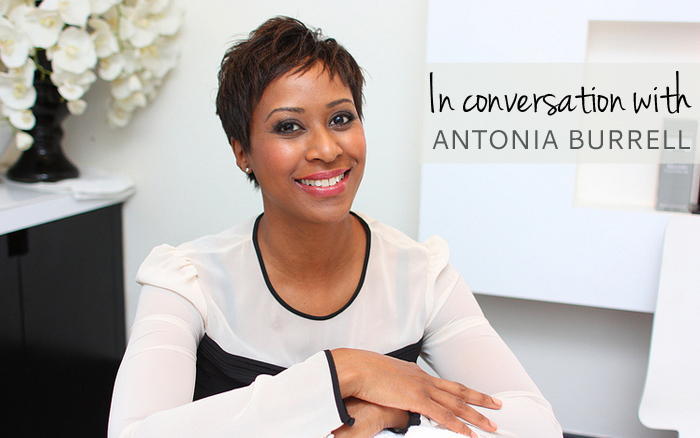 You can read more about Antonia and her range here.